A simple little dish with an added taste of Eastern promise! 1. To make the salsa, put all the ingredients in a bowl and mix to combine. Set aside for 20 minutes to let the flavours combine. 2. Spread the curry paste on the whiting fillets. Heat the oil in a frying pan set over a medium–high heat, then add the whiting and fry for 2 minutes on each side, until fully cooked. 3. To serve, spoon the tomato salsa onto four plates. Top with the whiting and serve with steamed basmati rice. 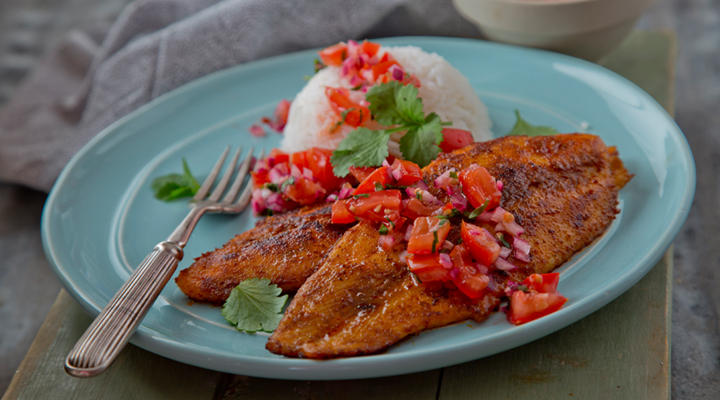 Tip: Whiting is also known as the chicken of the sea for its mild flavour.